Lacquered finish opposed to a waxed finish: what are the real pros and cons? For a lacquered finish the colour is applied and a polyurethane top coat is also applied on top giving a glossy or a semi matt finish. Generally it is a glossy finish, however it does depend on the colour chosen to whether the finished piece is very shiny or not. The polyurethane top coat gives a hard protection to the furniture and seals the wood, the wood can still breathe as it is only the outer facing wood which is coated. Lacquered wood protects the wood from liquid penetration, hot cups, crayons, although it is still advisable to use mats where possible and clean up spills as soon as they happen. Constant water will wear down the lacquer, becoming dull and having a mottled appearance. Lacquered wood can be wiped down with a damp cloth if it gets dirty but it is advisably to dry off the wood after. It can be dusted with a soft cloth and polished with an everyday spray polish. Other polishes or waxes can be used but generally it will not offer any more protection than a general spray polish. A wax finish does not have the same protection, the colour is applied in the same way but it is then finished with a liquid wax. The wood is not sealed in anyway and can breathe and take on the elements of its surroundings, such as smoke from an open fire. Rings will occur if mats are not used and spills will be absorbed into the wood. 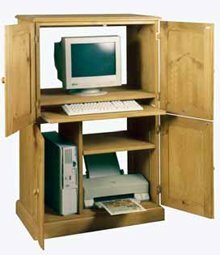 Waxed wood needs periodical waxing depending on what wear and tear it receives, a chest of drawers would probably benefit from a monthly wax, whilst a table would benefit twice a month. This is not as labour intensive as it sounds, only the top need be done with a clear wax and following the instructions on the tin. If a coloured wax is applied the furniture colour will subtly change over time. Six to twelve month intervals it is wise to wax the whole piece. The wax soaks into to the wood keeping the wood hydrated and keeps the colour sharp, if rewaxing was not adhered to the piece would fade and possibly start to split in places. Waxed furniture is easily restored if damaged has occurred to the finish. There are several products on the market to remove rings and marks. They will probably not remove these marks completely but they do a pretty good job. You can solely work on the damaged area and not bother too much with the rest. You can also rub waxed furniture down with either a very fine grade wire wool or sandpaper, working with the grain and once satisfied that the mark is removed re wax with a colour close or an exact match to the original piece. Lacquered furniture once damaged is a little trickier to restore. You can use wax crayons in a similar colour available in good hardware stores if a dent appears or chipped lacquer, the wax crayon just needs to be rubbed over the damage and they magically fill and repair the damage it is that simply. However, if the lacquer has started to peel or split for some reason then complete sanding down is required. The entire piece would need to be stripped as it is almost impossible to patch lacquer. However, once stripped the choice is what colour and finish once more! If you chose to have it re lacquered this is not a job for DIY it will need to be done professionally. Wooden furniture is a living piece so be careful where you place it, not to close to heat sources and away from sun light exposure. Also the temperature needs to be controlled as the furniture will expand and contract in extreme temperatures. If you follow these guidelines your piece of pine furniture will last a lifetime. 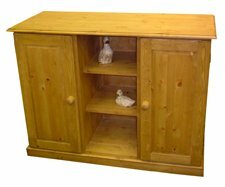 Wye Pine UK supply affordable quality solid wood Custom Pine Furniture. A truly environmentally friendly furniture range, with all timber sourced from forests that are sustainable.